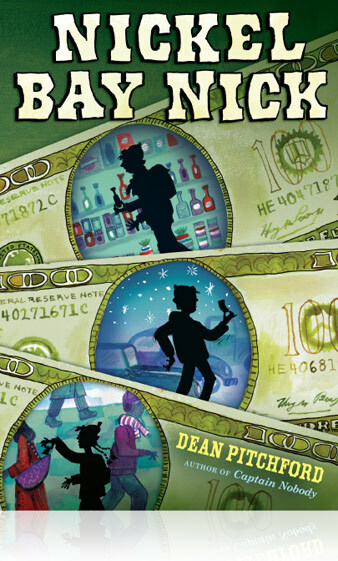 Marvelous Middle Grade Monday apparently really loves NICKEL BAY NICK! Two teachers in Union Grove, WI, shot a welcome-back-to-school video to “Footloose” that went VIRAL and got them an appearance on The Today Show! On Thursday, April 24, the 30th Anniversary of “Footloose” was celebrated with a screening at UCSB’s Script to Screen program, after which Dean sat for a Q&A with program director Matthew Ryan. Two of Dean’s songs – “Holding Out for a Hero” (J.Steinman) and “Fame” (M. Gore) – were performed by a cappella groups Vocal Rush and Ten during the week of December 16 on NBC’s “The Sing Off.” Click on their titles to check out these jaw-dropping performances! Last year, while on a book tour in North Kansas City, this boy shyly asked if I’d put his name in my next novel. 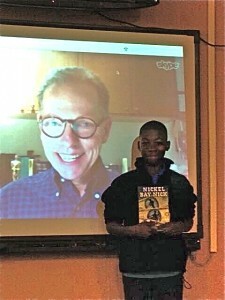 Oct. 29, while I was on a Skype with his class at Northgate Middle School, Veckens Francois was asked to read a passage from NICKEL BAY NICK, and when he read his name (on p. 83), his classmates cheered!